We all know fruits and vegetables are good for us and that we should eat more of them. But cooking vegetables can be a bit intimidating — there are so many different kinds of vegetables out there, so how's a cook to know which method is best for each piece of produce? By reading our quick and practical guide, of course! It's packed with helpful tips, including the best cooking methods to use when preparing all your favorite fresh vegetables, and delicious recipes to get you started. 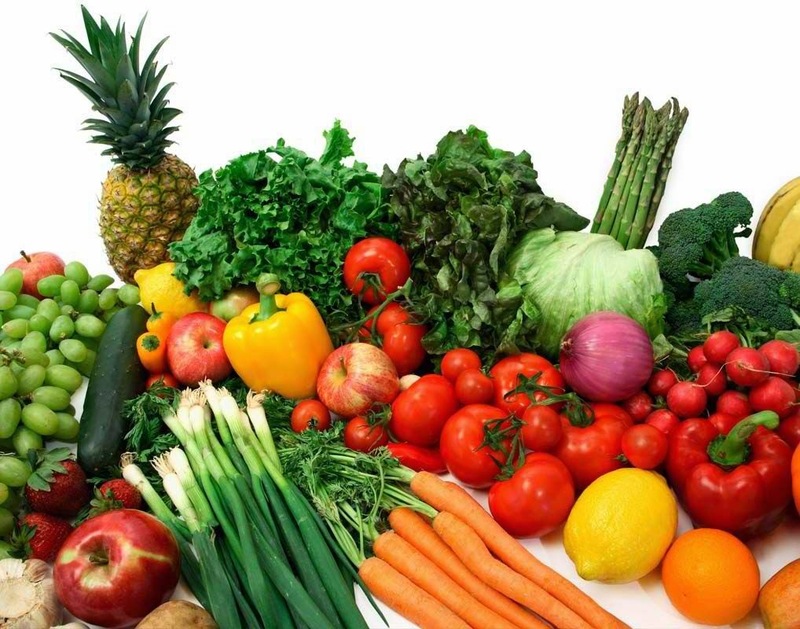 The composition of fruits and vegetables is mostly carbohydrates, as opposed to proteins in meats. Some fruits and vegetables have very firm cell walls and can withstand long heating. Others are more sensitive to heat and chemicals, and their color, flavor and nutrients may suffer. Acidulated water is water that contains an acid, such as citrus juice, vinegar, or white wine. The acid helps to prevent cut fruits and vegetables from turning brown when in contact with air. The amount of water to acid varies depending on the acid. It is best to experiment to see and taste what amount works to help prevent discoloration without affecting the flavor. Cut-up apples, artichokes, avocadoes and potatoes may benefit from acidulated water, as long as taste permits. Adding salt to water may also help to prevent discoloration in fruits and vegetables, but it increases sodium. When plants lose their color in boiling liquid, it may be due to an acidic or alkaline environment or the escape of gases or heat. It is common for bright green vegetables to lose their hue during cooking. To help retain their colorful pigmentation, a little baking soda (which is alkaline) is often added to the cooking liquid. But this practice may cause vegetables to turn soggy. In order to preserve the color of vegetables, it is better to shorten the cooking time; use tap water, which is a little alkaline; plunge the vegetables into ice water to halt the cooking process and then reheat briefly; or add a little protective seal of fat or oil right after cooking. This may be a bit of olive oil or butter. The use of an acidic ingredient in a sauce or dressing should be withheld until the very last minute, since the acid may further break down the cell walls. What are the Enzymes in Fruits and Vegetables? Flavonoids (polyphenols) are plant pigments that give vegetables and other plants their vibrant colors. Anthocyanins are the most plentiful flavonoids; they are responsible for the blue, maroon or purple colors that are present in blackberries, beets, blueberries, cherries and grapes. During cooking, these fruits and vegetables may lose their deep colors because these pigments are water soluble. The cooking water may change or become colored as their anthocyanins leach into the boiling water. Carotenoids are one of the most prevalent naturally occurring plant pigments. Brightly colored red and orange fruits and vegetables, such as apricots, sweet bell peppers and tomatoes, are fairly stable in water, but they are fat-soluble. If a little fat is added to recipes that contain these ruddy fruits and vegetables, then their vibrant colors may dissipate. Trace metals, such as iron from cooking tools or equipment, may also cause some fruits and/or vegetables to appear murky. The texture of fruits and vegetables may suffer from cooking. This is because their cell walls break down with heat and release water. At first, fruits and vegetables might lose their crunchiness but still be difficult to chew. With additional heating, their cell walls usually break down further and they become more tender. While this method does require some oil in the pan, it should only be a moderate amount — just enough to get a nice sear on your meat and vegetables. It’s effective for bite-sized pieces of meat, grains like rice and quinoa, and thin-cut veggies like bell peppers, julienned carrots, and snow peas. Like sautéing, boiling vegetables is a quick and easy technique. When you want to retain the flavor and crispness of vegetables such as green beans or broccoli, wait until the water is at a full boil. Toss in the vegetables and cook them quickly, a technique called blanching. Simmering also uses water to cook vegetables, but at a lower temperature, before the water begins to boil. This slow-cooking technique is great for dried bean, potatoes, beets and other root vegetables that require longer periods of cooking in order to become tender. Roasting vegetables such as asparagus, squash, or onions is as simple as putting them on a baking sheet, drizzling them with a little vegetable oil, and popping them in a 400 degree oven. “The high oven temperature of roasting cooks meat and vegetables quickly and caramelizes the sugars on the surface, creating a crunchy and sweet flavor,” says Scott Samuel, a chef and instructor at the Culinary Institute of America at Greystone. Roasting helps to preserve not only vitamins and minerals, but also flavors that can be lost with boiling. Steamed vegetables are synonymous with healthy eating for good reason. Steaming cooks vegetables without submersing them in water, so they are more likely to retain vitamins and minerals. Unlike sautéing, steaming doesn’t require oil, so it’s a great way to prepare vegetables if you’re watching calories. The best vegetables for steaming include broccoli, carrots, cauliflower, green beans, leafy greens like spinach, and other relatively tender vegetables. When the weather is warm, grill vegetables outside on the barbecue. Like roasting, grilling locks in flavor and caramelizes the surface of vegetables, giving them a crispy sweetness. Grilling is a terrific way to prepare corn, sweet peppers, zucchini and other squash, onions, potatoes, and a variety of other vegetables. Nuking may be the healthiest way to cook because of its short cooking times, which results in minimal nutrient destruction. Microwaves cook food by heating from the inside out. They emit radio waves that “excite” the molecules in food, which generates heat, cooking the food. While microwave cooking can sometimes cause food to dry out, that can easily be avoided by splashing on a bit of water before heating, or placing a wet paper towel over your dish. The way that microwaves cook food nixes the need to add extra oils. The best part is, you can microwave just about anything, from veggies and rice to meat and eggs. And studies suggest it may just be one of the best ways to preserve nutrients in veggies; microwaving broccoli is the best way to preserve its vitamin C, for example. Just make sure to use a microwave-safe container. The same goes for boiling’s cousin, poaching — no additives. Basically, poaching means cooking the given food in a small amount of hot water (just below boiling point). It takes slightly longer (which some experts believe can decrease nutrient retention), but is a great way to gently cook delicate foods like fish, eggs, or fruit. Vegetables feature in many classic sauces and spreads. A classic favorite from Spain, romesco sauce, combines roasted red peppers with almonds, hazelnuts, olive oil, and vinegar to create a flavorful sauce that can be used with fish or vegetable dishes. Classic Italian pesto sauce is made with generous handfuls of basil blended with pine nuts, olive oil, and parmesan cheese. To make a rich-tasting vegetarian pate, sauté mushrooms and onions, season with Italian spices or herbs de Provence, and blend in a kitchen blender. Raw food diets have gained tons of attention recently, and for good reason. Many studies suggest there are of benefits of incorporating more raw foods into the diet: Studies have shown eating the rainbow consistently reduces the risk of cancer, but the jury’s out on whether raw or cooked is really best overall. On the one hand, since the diet is mostly plant-based, you end up eating more vitamins, minerals, and fiber, with no added sugars or fats from cooking. But while some raw items might be super-healthy, studies have found that cooking can actually amplify some nutrients, like lycopene in tomatoes and antioxidants in carotenoids such as carrots, spinach, sweet potatoes, and peppers. 2) Cook in the least amount of water. 3) Minimize the contact time with water. 5) Never boil over high heat too long. 1) Wash Before Cutting. Cutting a vegetable breaks its cell walls, allowing nutrients to escape into any water on contact. By washing uncut vegetables, nutrients stay safely tucked inside their cell walls and won’t be leached into the water. 2) Keep the Peel On. Many key nutrients are found in or just under the vegetable peel, so leave the peel on whenever possible. 3) Cook Soon After Cutting. Nutrients can be destroyed when exposed to light and air. Cook and eat vegetables soon after cutting to keep vitamins and minerals secure in their cells as long as possible. 4) Cut Larger, Uniform Pieces. Larger pieces mean fewer cell walls severed and fewer nutrients lost to heat, light, or cooking water. Cutting uniform pieces ensures that everything is done at the same time, eliminating overcooked pieces and loss of nutrients.